Prompted by a recent email blast from Jason Mraz: songwriter, musician and environmental activist, I followed a link and discovered REVERB. This organization works with music tours to help promote recycling, waste reduction, and environmental education to fans and tour crew. On their site they say, “…being green is not all or nothing; many people doing some things will have more impact than some people doing everything. All of us can be active participants in protecting the environment and creating real, large-scale, and measurable change.” You can also check out their recent tour partners. We can all spread the word in ways that touch us most. For some, like us, we speak and act upon our environmental consciousness professionally through our interior finish and furniture selections; for others, like REVERB, it’s through songwriting and music. Every answer to that question is important so please continue to spread the word. When Associates III embraced a greener approach to interior design more than a decade ago, we’d been working towards the goal of becoming a more socially responsible company for just as many years before, if not more. 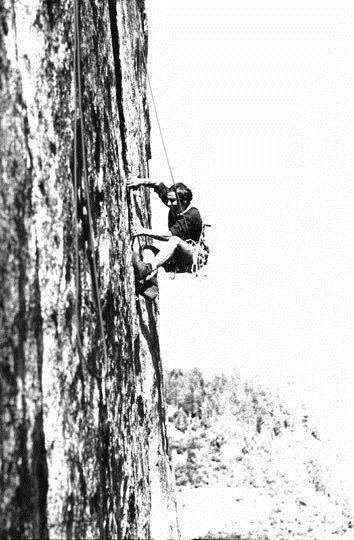 Yvon Chouinard climbing in Yosemite, 1960s. Patagonia provided us with inspiration early on as a role model of business based on green principles and much more. Yvon Chouinard and his family, friends and team walked their talk, from the products they made, to the consumption of materials and energy to fabricate them, and to their goals and mission as a company. Everything they did reverberated within their walls and poured all the way out of their doors, influencing customers as well as peers. What sets them apart? You could argue that many things do but the one that I come back to is that they lead by example. Their business model is fairly transparent, not perfect but always enlightening; we learn just as much from their mistakes as well as their achievements. Their business grew out of a love for the outdoors, primarily the sport of mountaineering, and it’s a perfect metaphor that reflects growth, hiccups along the way and how stamina and determination to do the right thing can bring you to the summit, again and again. And for a company that exceeded $400 million in sales last year, it seems to be a winning formula. In my opinion, doing the right thing and doing what you love is the perfect pairing, inextricably linking motivation and purpose. Making socially and environmentally conscious decisions, even if it hurts the bottom line in the short term, ultimately promotes growth in the long term; growth in sales, customer retention and loyalty, and product innovation, as shown by Patagonia. It also translates to being one of the most transforming recipes for team development within a company. Inspired teams are clearly incentivized by a common or greater goal, which in turn produces a unique environment that promotes out of the box thinking and a willingness to try new things and take risks. With an eye on long term health and prosperity, it can lead to some amazing endeavors, developing an attitude of can-do verses status quo. Today, Patagonia still inspires me like no other company. 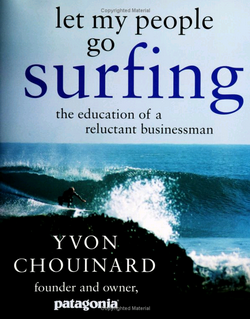 And if you’re interested to know more about them, try reading Yvon Chouinard’s book – Let My People Go Surfing; The Education of a Reluctant Businessman. We’ll be reading along with you later this spring in our A3 book club. Can’t wait for that discussion!